Looks like one of my main issues has finally made the questions in a debate. What do we do about energy? Too bad neither understands what energy is. Both support ethanol, which goes to show you just how ignorant they are. The United States has 87 million acres devoted to corn. At most if 100% of this were diverted to ethanol production, it would replace 14% of gasoline supplies. The problem is the by-products produced from the ethanol production could not all be consumed or used. It would be scrapped while at the same time it would most likely put other competing feed producers out of business. I like corn on the cob and I like a good steak. I wonder what a rice fed cow tastes like? But the other problem is pretty basic. You can get about 1.5 to 2 gallons of ethanol out of a bushel of corn. A bushel of corn is above $2.50 now. What happens to the price of ethanol when the bushel price goes to $5 a bushel? Then there is the problem of burning natural gas and coal. Natural gas is in short supply and coal is dirty. Souder at least had his tax subsidy correct on a gallon of ethanol. We are giving away 52 cents for each gallon of ethanol produced. If ethanol is so great, let it stand on its own. End the subsidy now! I watched the debate between Souder and Hayhurst and I would say Souder won the debate. On the question of Social Security, both candidates showed their clear lack of knowledge. Both pledged not to raise taxes while at the same time. Souder stated Social Security taxes on our children would have to rise to 20% with a combined total of 40% in the future. Hayhurst stated a pledge to keep a great program going. Is Hayhurst ignorant or stupid? He is older than I and should have seen first hand the impact of the increase in both base and tax rates of social security on workers wages, savings and the economy. This disconnect between where the money comes from and where it goes seems to escape him completely. He also referred to Bill Gates paying very little in Social Security taxes compared to a person making a $100K. Hayhurst apparently does not understand that it is not the taxes paid that determine ones social security benefit, but the wages subjected to the social security tax. If the tax rate were to be applied to all wages, then Bill Gates social Security check would be very, very large. Souder again states he supports incentives for people to save. My question to Souder is after Social Security takes 20% of your wages, where do you get the money to save to take advantage of the incentives? Furthermore, with the unified budget in deficit and the general budget deficit $200 billion larger than that is, where does he propose the funds come to provide savings incentives? Sounds like Enron Accounting to me. As I have stated since 2002, there is no painless solution. Workers will again send Social Security on average $4,000 this year and a similar amount in 2007. What are you getting for this $8,000? Social Security is not getting better, but worse. As I was driving along 24/ Jefferson at Time Corner I counted over 12 Souder signs. Then between there and Jefferson Point I counted another ten signs. When I got to Dupont and Auburn road there were no less then eight signs. It is obvious Souder has a lot of money to spend on signs. To bad he does not use that money to tell us what his issues are. I have seen his TV ads and heard his radio ads, but in everyone, he really says nothing. I know first hand how hard it is to condense an issue down to a 60-second sound bite. However, one statement he makes that just burns me is his insinuation he is a conservative keeping federal costs low. He voted for Rx drug coverage for seniors. How is this keeping government small and fighting deficits? He voted to take from my kids and me over $4 Trillion and give it to individuals who never paid for a Rx drug program or who will not pay sufficient taxes to fund this new "government program." The Rx drug program is no different than Medicare nor Social Security in the way it is funded. Mark Souder views Social Security as a shell game, then why on earth would he vote to create another shell game, this one called Medicare Rx Drug Program. Mark Souder is not a conservative. If he cared about deficits, he would not have voted for a $4 Trillion give-a-way of our childrens tax dollars. If Mark Souder cared about the future of the United States, your children he would be addressing the problem of budget deficits, Social Security, Medicare, tax reform, energy, immigration, identity theft, defense and more. The problem is he speaks in sound bites with no substance to back them up. Here are my issues, maybe they are also yours. Ask both candidates the hard questions. A sound bite may sound great, but it is nothing more than words if there is no plan. National Defense: Those who serve our country need to be trained and be provided the equipment necessary to carry out the tasks assigned to them. We should never knowingly send our men and women into combat with out-dated equipment, poor training and poor planning. They are putting their lives on the line, the least we can do is provide them the training and equipment to carry out their assigned tasks. Budget deficits: We hear a lot of talk about cutting the deficit in half. In fact they have talked about it as far back as I can remember. I am 49 years old and I simply cannot remember a surplus year, can you? Who has been running this country, the politicians or the voters? I hear people complain, but do we ever take action? There are only two methods available to cut deficits, cut spending and raise taxes. The general budget deficit was $726 billion in 2005, but it was reported as a $554 Billion unified budget. Our representatives say they are against using social security revenues to offset general budget expenses, but they continue to use the Unified Budget numbers. They do this to make the numbers look better. I will not do this. Tax Reform: Americans and Business spend too much on determining their taxes. Why should one company profit at the expense of another simply because a politician wants to give your money away? Individuals and business would do better understanding the tax code and knowing the tax code would not change every few years. Congress has given preferential treatment to companies groups and individuals. This is unfair, creates thousands of pages of code and is inefficient. Income is income, treat income as such. Treat all taxpayers fairly by not holding out carrots for preferential tax treatment. This will reduce the tax code to less than 50 pages. It will greatly reduce compliance costs and tax court litigation. Energy reform: Congress has debated energy policy for decades and what do we have to show for it? It is time to stop subsidizing inefficient and wasteful energy programs. Wind power has now reached a level where it can compete with other forms of energy. Identity Theft: In 2004 9.2 million complaints of identity theft were filed. The IRS is the single largest contributor to identity theft in that it requires financial institutions, employers and now colleges to collect an individual’s taxpayer identification number for tax purposes yet puts no restrictions on the entity collecting the information. As a result these entities have lost control of this identifier. To begin to correct this serious error in judgement, we need to put strict controls on the access and use of these identifiers. I propose that no non-government entity would be allowed to utilize a social security or taxpayer identification number in its daily business as account numbers, PIN’s, employee numbers, insurance numbers, school ID’s or any other method of identification. In addition, government agencies should be required to perform their own independent identity verification and not rely on a social security number. This would provide a layered security approach. The social security number should be used for social security purposes only. Illegal Immigration: In 2005 there were 4 million American’s unemployed and 19 million who stopped looking for work. The share of unemployed with less education is way up. The U.S. does not have a 5% unemployment rate. The 5% unemployment rate is used to support immigration. Unemployment among less educated Americans is up 11% while it is 13% for dropouts. The perception is the U.S. is in need of less educated workers, which is not true. They already have the highest unemployment rate, the lowest wage rate and employment participation among less educated had declined dramatically. They took the poorest workers and made them poorer. Less educated immigrants and less educated Americans do the same kinds of work. There is no such thing as a job a American will not do. Allowing legal status to illegals has enormous implications for America’s poorest workers. America is not short of less educated workers given the high unemployment rate and the high number of less educated workers who have stopped looking. Internal Revenue Service Reform: Individual Taxpayers have little statutory law to force the IRS to answer questions, meet deadlines or make corrections. Without a final determination or Statutory Notice, taxpayers cannot seek help from the Tax Court, leaving the taxpayer in limbo. In essence the IRS could take 100 years to resolve an issue leaving the taxpayer with no recourse. Personal Freedoms: Our personal freedoms are under attack. The Right to bear arms is being restricted. Religious freedoms are under attack. We need to restore and strengthen our personal freedoms. Pension, 401K and profit Sharing reform: If you are laid off, you should be vested in company matching 401K, profit sharing and pension plans. "On-us" check cashing reform: It is not honorable to charge a fee to a non-account holder at the bank the check is drawn on. The bank is providing a service to the account holder, not the endorsee. All employer paychecks need to be readily cashable in a local bank without fees and surcharges at the bank on which they are drawn. Veterans: As a Navy veteran, I know the hardship that military life can have on families. I also know first hand that injuries sustained in the line of duty can take years to recoup from if ever. We need to maintain our VA hospitals and provide those who have been injured the best medical care available. I also support changing the index used for adjusting veteran's benefits from the consumer price index to the Social Security Wage Index. This change will maintain the same standard of living benefit throughout the veteran's life. Social Security Disability Program: I support the Social Security Disability Program covering the disabled and survivors of workers who die. This program unlike Social Security's Old Age Survivors Insurance Program is based on a covered loss and not based on living to a particular age. Social Security Old Age Benefits: This program was not designed to work. A program that pays those born after 1985 just 29 cents back for each dollar of taxes and credited interest is not fair. Americans want value for their dollar. You can buy a value meal at about any fast food chain consisting of a sandwich, fries and drink for about $4.00. If Social Security were a value meal, it would cost $13.79. If we want to save social security, then each adult must send a check today to social security for $87,000, or cut benefits by 40% or raise taxes by 85%. There simply is no painless solution. How firm are you on saving social security? I support repealing the Social Security act. In its place I would propose paying those seniors who are found to be in need, a means tested benefit of $1,133 a month. This benefit would be indexed by the change in the United States Average Wage Growth instead of Inflation. This would maintain the benefit at the same level relative to any given year, which the current program does not do. The worker would be required to open an IRA style account at a financial institution of their choice where the employer's share of the social security tax would be deposited. The employee's tax would never be taken out of the check so that the employee could use these wages for debt reduction, retirement, education, health care, etc. The total controlled by the employee would be about $3,600 per year ($1,800 in the IRA style account and $1,800 left in the paycheck). Mark Souder’s Statement on Social Security. 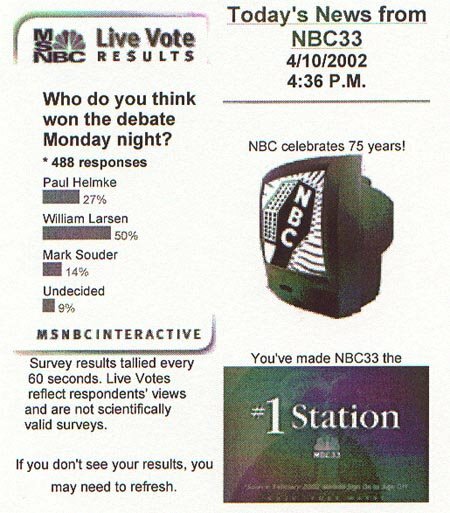 Mark Souder spoke to Prime Time 39 on 3/12/2004 and referred to Social Security as a "shell game." He stated, "For people under 30 it's probably going to be income based. I am not saying we're going to pass that. It will probably be passed after I am dead." He continued "If you're 40, you might make it through the system. But if you're under 40, and certainly under 30, you had better start planning because if you want to have a decent retirement you’re going to need supplemental funds." We are all in this boat together. "Actually, it's today's retirees who are sitting on the deck with mint juleps in hand, while the boomers and X'ers are below in the galley rowing like slaves to the command of stroke, stroke, stroke. Seniors would like the galley slaves to continue to believe the hoax that one day they too will have the opportunity to sit on the deck with their feet propped up. Only problem is, when it's finally the galley slaves turn on the deck, the ship will long since have sunk. The slaves are just now realizing the cruel hoax perpetrated upon them, and are about to ban together to stop the ship dead in the water and use their oars as clubs." "I sit on a man's back, choking him and making him carry me, and yet assure myself and others that I am very sorry for him and wish to ease his lot by all possible means-- except by getting off his back." I read the other day that many are pointing to the fact the Veterans Administration (VA) healthcare network provides care to veterans at 20% less cost than Medicare provides to seniors. They are pointing out that government could provide healthcare costs at considerable savings to seniors if run the same way. As a veteran with a service connected disability, I know first hand what it is like staying over night in the Fort Wayne Medical Center. I also know what it is like to obtain treatment at the VA center in Marion, Indianapolis, Fort Wayne and Roanoke, VA. Though the VA centers have greatly improved their quality of care, the time it takes to get seen is just as long. I had to travel to Marion to get doctors authorization for treatment in Fort Wayne. I drove over 100 miles for a five-minute consultation in August. I had my MRI and EMG, over a month ago, but still do not know the results. The problem with Medicare is that costs are paid for on a cash flow basis instead of accrual. Cash flow accounting will always result in higher costs. Pay little to nothing during your working lifetime and then when it is time to collect pass the bill to those currently working. It is the classic pyramid scheme. The other problem with Medicare is there is no cost control on the part of the patient. They have no idea of the cost until after the service. Once you have met the deductible, it costs very little for subsequent visits. Rather like an all you can eat buffet. One method would I recently read about used to control costs is to provide a cash out lay up front. The insured can use it to pay for the first $500 of medical bills. The next $1,000 or $1,500 the insured pays 100%. Anything after that it is split 80/20. This puts control of healthcare in the hands of the user. However, the bottom line is that it is not the insured or company, Medicare or Medicaid that pays the cost of healthcare, it is the worker/taxpayer. If you are given $500 up front to pay for the initial cost of healthcare the money had to come from some place. It certainly did not originate with the insurance company or the government. If you think our company creates the money, you are wrong, it ultimately originates with the consumer/taxpayer. Candidate Hayhurst states he wants affordable healthcare. We all want affordable healthcare. Did they say "divisive" or " decisive"
Question: Traditionally, Northwest Allen County schools have received strong community support. Do you feel two high schools would be divisive to the community? Strongly agree two high schools would be divisive, somewhat agree two high schools would be divisive, somewhat disagree two high schools would be divisive, or strongly disagree two high schools would be divisive. here is what the Expert from Educational Services Company had to say about the responses. I was speaking with some people about the survey the other day and was reading the questions. One of them asked me if I had said "divisive" or " decisive?" These two words meanings are totally opposite of each other. So I decided to do a quick survey, by no means errorless, but it raises a question about the accuracy and legitamacy of the question. When I substituted divisive with the word divide, I got some different responses. Since this was a recorded survey and all heard the same question the same way, how many misunderstood the question? Could they ask the question be repeated? 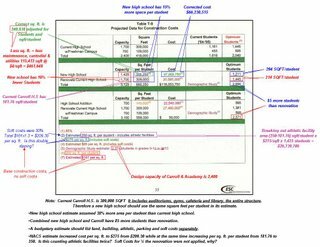 Here is a link to the department that keeps track of all school construction costs. There report is short and very informative. Soft costs run 20%. NACS Feasibility report used 30% and $275 per sq. ft. I found more errors, does not surprise me at all. It is amazing how many errors there are in this Feasibility Report. Table T-8 has only two numbers that are correct! All the others are wrong! This table identifies the tax increase for every $1 million borrowed at 5%, 5.5% and 6% over a term of 21 years. It also goes onto identify an escalation rate of 6%, 7% and 8.28% in the Total Tax Valuation. If you borrow $63.75 million at 5% over 21 years the yearly payment is about $4,972,252. If the TTV is $2,259,898,154 then to raise enough revenue each dollar of assessment needs to be charged $.0022 or more commonly 22 cents per $100 assessed. This means a home valued at $150,000 I calculate an increase of $330.03. This is no where close to the $213.96 identified on the Yellow Flyer nor at the June Board meeting. I hope I made a math error, but I have been over it several times and have not found one. Maybe my bifocals are playing tricks on me. Maybe someone out there can see if I made an error. I sure hope soe, I do not want my taxes going up $330. Did anyone bother to check the math! Did anyone on the school board review this report? Superintendent Yager must really be naïve to think that the Blue and Yellow petition drive is about only two things; One or two high schools? Does he think that there were not other groups who were going to file a remonstrative against the school boards’ voting to renovate Carroll High School? I spoke with numerous people after the vote and got a good feeling that I could easily gather 100 signatures. I was told it would make no difference if I had 5,000 signatures or just 100 signatures. I also learned that another group was gathering signatures. This group turned out to be one that was for two high schools. My group would have just been against expansion until a new long-term plan was developed. There are many reasons for signing the blue petition, not just one. At the board meeting at which the vote was taken on renovation I asked specific questions as to capacity, cost and long term plan, none of, which were answered. First off, south of Indianapolis has higher building costs. Second 1,500 students are greater than 1,425 by 5%. But the 1,425 is 85 students more than the designed capacity of the renovation project. This means the Franklin Community High School is 11% larger than the school NACS should be evaluating. If you do not believe me just look at the two schools recently built. Cedar Canyon Elementary is 92,000 sq. ft. and holds 550 students. The cost per sq. ft (land, soft costs, brick mortar, the whole nine yards is $193.48. Why does their feasibility study use $275 per sq. ft.? Sure a high school is bigger, but it should cost the same per sq. ft. Still not sure, let us look at the Carroll Middle School for $35 million with stadium, land, parking and about 184,000 sq. ft. This comes out to be $190.22 per sq. ft. Carroll high School has 309,000 sq. ft or 181.76 sq. ft. per student. To rebuild Carroll at the same construction costs as the two recently built schools would be a tad over $50 million. Here we have two different types of schools elementary at $193.48 per sq. ft (2006) and middle school $190.22 per sq. ft. (2004). Are these two numbers close? If so, would you expect a high school construction cost per sq. ft. to be much different? The roof loading to handle snow, ice and wind is the same for any school. The walls, footer and floor also have to meet identical codes. The construction materials are basically identical for any school being built. Why did the Feasibility Study use $275 per sq. ft. and inflate the sq. ft. per student from 181.76 square feet at Carroll to 250 sq. ft per student at a proposed new school? "The blue leaders were aware of these expenditures yet now have chosen to accuse the NACS board and administration of misuse of public funds." "Blue leaders are aware of this plan and have now chosen to accuse the administration of poor planning." "The blue team leader knew of this addition and enthusiastically expressed his approval for the position but now has chosen to criticize the school corporation." "The yellow team has been consistent when stating facts, figures, data and research to support the board’s one high school plan. The board’s one-high school plan accomplishes two goals – it provides a superior educational plan for students in grades K-12 and lower taxes for all constituents." The blue team leader is/was apparently knew a lot about this. Where did they get the information? Why was not the public given the same information? Why when questions were asked at public board meetings were they not answered? NACS wants I am told $10 million for technology upgrades. I am against this because they do not know how to use a simple tool such as posting information for all, not just the blue team leader to see. This is a public education, not a private school. The NACS Feasibility Report has numerous million-dollar errors in it. It lacks the basics for even a poorly written report. If the superintendent wants the public to support his proposal, then educate the public, do not hide the facts. I have read the yellow flyers and find there is no supporting documentation behind their so-called facts. What I have seen is many references to a Feasibility study that is not worth didly. Does the Superintendent think the taxpayers are blind and stupid? Just a quick note. Last night was the second time that I have come across very upset school district taxpayers. They had signed the yellow petition based on being told a feasibility report done by experts showed a $118 million price tag. I handed them Table T-9, explained that the Cedar Canyon Elementary school was 92,000 sq. ft and cost $12 million, the Carroll Middle School was $35 million and had about 184,000 sq. ft and that these two schools though different (one had a foot ball field and track) would provide them with a good idea of construction costs. They were angry with both sides. The blue petition side for not giving enough information and the yellow side for not giving correct information. There are some angry petition signers out there. They clearly saw the errors in the feasibility report and signed Blue. This June 1, 2005 NACS Feasibility Study is going to come back and bite some people. Have a great day. I gave my analysis of the NACS Feasibility done by Educational Services Company to another engineer to read. They concurred with me that the math is wrong. They also agreed with the analysis that the study has nearly $27 million for athletic facilities buried in the $118 million price tag. I have sent my analysis to over 700 individuals and not one has identified a math error. However, some have sent stated they disagreed with my analysis or that I played games with the numbers, but not one has identified a specific error. 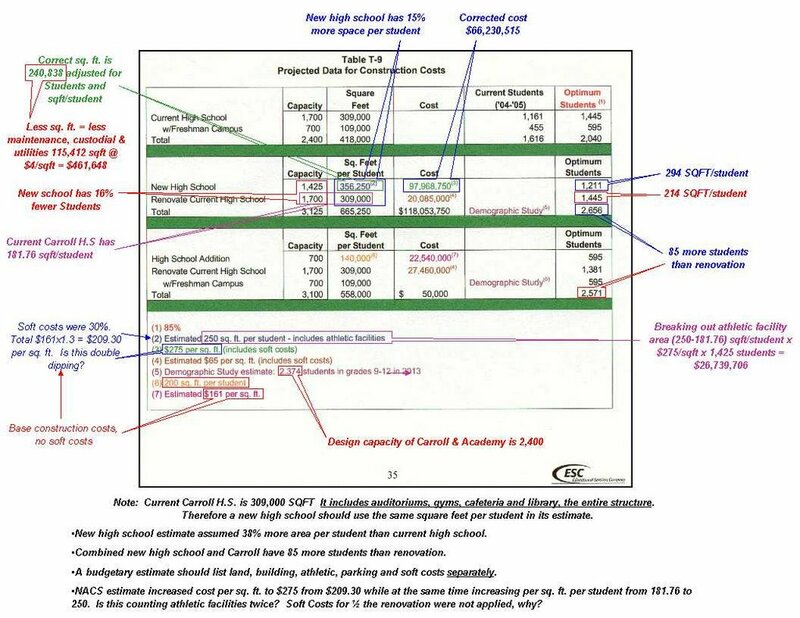 I sent a request to Educational Services asking if this report they presented was correct and if not to correct Table T-9 and any other errors. My first request for answers was over two weeks ago. I sent another request along with the marked up Table T-9 to the president of their company on Friday. As of today, I still have no answers. The staff at Educational Services Company of Indianapolis lists numerous individuals with backgrounds in education, architecture and more. A simple table such as the one in the feasibility report (T-9 on page 35) should be child's play for professionals to either correct or answer they stand by their report. Why are they taking so long to answer? Did this report get published without a proper review? Does this report have major errors, which could change which petition would sign? If taxpayers have signed a petition based on this feasibility report and the report turns out to have major errors in it, what should be done or can be done? Who is liable for these errors? The taxpayers have paid good money for an accurate report. Did we get an accurate report? NACS Board position is one school can offer more courses, is this true? The feasibility study states that larger schools can offer more courses. I have been trying to figure out just how many more courses might be able to be offered. Currently there are 120 courses offered with three of them being combined with others. 46 courses have one session; 29 courses of two sessions; 13 courses have three session; 4 courses have four sessions and after the number of courses drop as sessions increase. Looking at the courses that correspond to two or fewer sessions each, correlate very well with non core curriculum classes. These are the type of non core classes that could be offered as enrollment increases. However, let us think a bit about what is happening. For every new student who arrives at Carroll, this student is already dedicated to taking many core courses to graduate such as math, English, science, gym to name a few. This means out of six class periods a day, most have but 1 or 2 periods available to take an elective. As the course offerings increase, the base is growing ever larger. Let us think in terms of a pyramid. With two levels, we have three blocks. To add another level, we need three additional blocks. To add the fifth layer we need five additional blocks. The problem is it takes ever more blocks at the base to add height to our pyramid. The very same problem faces a growing high school. Unless every new student enrolled above the previous enrollment total wants to take something absolutely different than those now offered, the number of courses added grows ever slower. The only reason why a course is not offered is because of an insufficient number of interested students. Student interests fit a bell shape curve where the majority of students will end up taking the same classes from a given selection over time. Expanding this selection can only happen if those toward the outer edges of the bell shape grow in number sufficient in number and want to take something else. Does it require up to 400 additional students to offer an other course and if so, how many more after that to add just one more course?